Bound in ninteenth century full calf edges gilt a very lovely copy. Usually ascribed to John Bodenham, who planned the collection, though the work appears to have been done by Nicholas Ling. Cf. Dedication; also DNB.p. 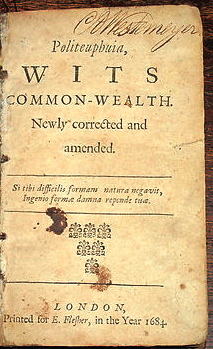 Often cited as Wits’ commonwealth, and some editions appeared under that title. Published first in 1597, as the first in a series of which Mere’s “Palladis tamia”, 1598, was the second, “Wits theater of the little world,” by Robert Allott, 1598, the third, and “Palladis palatium, wisedoms’ pallace,” 1604, the fourth. Cf. DNB. Nicholas Ling was born in 1553 in Norwich. His father, John Ling, was a successful parchment maker who owned sev­ eral income properties which he later bequeathed to his third son, Nicholas. On 29 September 1570, when Nicholas was sev­enteen, he began to learn the book trade as an apprentice in the London print shop of a prominent stationer, Henry Bynneman. While Ling was still an apprentice, he was joined in Bynneman’s shop by a young man named Valentine Simmes. It seems likely that the two apprentices became friends during this time: it is possible that this relationship had a significant impact on the publication of QI Hamlet. But that would come many years later. Three years after becoming a freeman of the Stationers’ Company in 1579, Ling set up a shop at the “signe of the Maremaide”5 in St. Paul’s Churchyard in 1582, a shop leased to Ling by his former master, Henry Bynneman. For three years Ling remained in London, but he maintained his connections to Norwich, returning there in 1585 and remaining there until 1590, the year of his father’s death. Ling then returned to London where he would remain until his own death in 1607. We can infer that he probably used an inheritance to help establish and then ex­ pand his London publishing business, since businesses such as Ling’s initially required significant capital.” Like the majority of London’s Stationers, Ling’s shops were located in or near St. Paul’s throughout the twenty-eight years of his career.. His fi­ nancial resources and his family connections, combined with his association with Bynneman, would have assured Ling a se­ cure place in the community of printers and publishers in Lon­ don. He eventually owned English Stock, held office in the Sta­ tioners’ Company, and in 1603 served an abbreviated term as Renter Warden.7 It is not likely that a stationer enjoying this kind of success would have had any need to make money publishing illegitimate texts or dealing with bit players in search of a hasty pound. Early in his career, Ling’s publications were largely reli­ gious works, but by the time he had established himself securely in the London publishing community, his publications became noticeably more literary; these included works by Thomas Nashe, Christopher Middleton, Nicholas Breton, Edward Guilpin, Tho­mas Dekker, and William Shakespeare. From the evidence sup­plied by advertisements on title pages, Ling’s shop was the cus­ tomary place for the sale and distribution of books that carried his imprint, even when that imprint was shared. From his deal­ ings with the Stationers’ Company and with other businesses in London, it can be safely assumed that Ling’s name was known: surely his was a familiar face in the community. Nicholas Ling’s connections with the printer James Rob­erts may have begun through Ling’s association with John Charlewood, under whom Roberts apprenticed. Charlewood and Ling shared at least one entry in the Stationers’ Register, An­thony Munday’s The English Romayne Lyfe (STC 18272), dem­onstrating that Ling knew and worked with Charlewood in the early days Ling’s career. The entry was made on 21 June 1582, only three years after Ling completed his apprenticeship and three years before he returned to Norwich. It may have been during this time that Ling met Roberts; the records of the Statio­ners’ Company and the imprints recorded in the STC show that the two stationers frequently conducted business with each other.